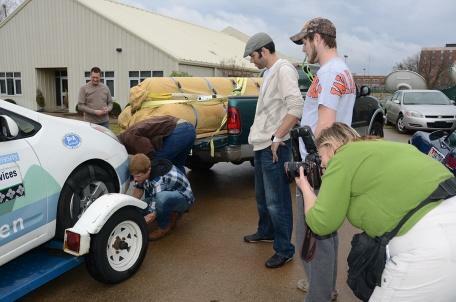 Terry Young, kneeling left, takes the initial steps to prepare the 2005 Toyota Tercel to be taken off the trailer on Ricketts' own flatbed truck after the group arrived Feb. 18 at the university. After 5,230 miles — a historic 2,600 miles driven with no gasoline in two alternative fuel vehicles — MTSU’S Dr. Cliff Ricketts and his support team weathered stormy Middle Tennessee weather and successfully returned to home March 18. Driving without gasoline, their fuel sources consisted of hydrogen from water separated by sun (solar), all produced on the MTSU campus. Hydrogen expert Terry Young of Woodbury, said the 1994 Toyota Tercel had approximately 70 miles of hydrogen-related fuel and the 2005 Toyota Prius had 20 miles left when the quest ended in Long Beach. Young and engineering expert Mike Sims of Jackson, Mich., estimate there was enough hydrogen left in transported tanks to drive at least another 365 miles. Some of the hydrogen they left with from Murfreesboro on March 11 had to be dropped off in Amarillo, Texas, because it could not be transported into New Mexico on a trailer. MTSU senior Aras Alexander of Houston, Texas, was among those making the trip. He had been in Ricketts' alternative fuels class last fall. Other team members included Duane Griffin of Murfreesboro, who has sought advice from Ricketts for his own alternative fuel project; Rick Presley of Orlando, Fla., and formerly from Mt. Juliet, Tenn., where he was a high school student of Ricketts in the 1970s; and Paul Ricketts of Versailles, Ky., the youngest son of Cliff and Nancy Ricketts, who are Wilson County, Tenn., residents.